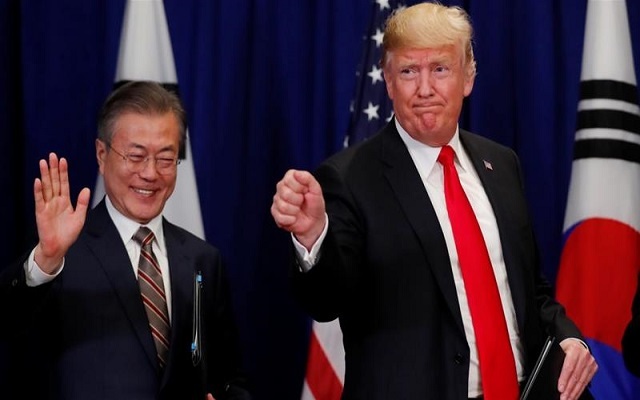 US President Donald Trump will host his South Korean counterpart Moon Jae-in next month, Seoul said Friday, after the latest summit between Washington and Pyongyang ended in deadlock. Moon has long backed a policy of engagement with nuclear-armed, sanctions-hit Pyongyang and was instrumental in brokering talks between Trump and North Korean leader Kim Jong Un. But the failure of Kim and Trump to reach an agreement in Hanoi on curtailing Pyongyang’s nuclear programme in exchange for relaxation of sanctions has raised questions over the future of the process. Moon will visit Washington for two days from April 10, an official from the South’s presidential Blue House told AFP. “The two leaders will have in-depth talks… to coordinate their stance on setting up a peace regime on the Korean peninsula through complete denuclearisation,” Yoon Do-han, the senior presidential press secretary said Friday. Earlier this month, Pyongyang abruptly pulled its staff out of an inter-Korean liaison office, but the officials came back to the joint facility in the Northern city of Kaesong days later. Their return came after Trump announced he had “ordered” the withdrawal of additional sanctions — without identifying the measures — against Pyongyang by the US Treasury.